About forty minutes from my house (in northern New Jersey) there is a road called Shades of Death Road. This spooky name isn't something assigned to it by local folklore - that's the road's actual name. Of course there are a wide variety of superstitions surrounding the road, ranging from being able to see shadowy figures walking down it to (if performed just right) a ritual you can do to summon a ghost. I have personally visited Shades of Death Road in high school with a group of friends; unfortunately it was a bit of an anticlimactic trip. - Highway men used to hide in the shadows provided by heavy tree cover and ambush their victims. Subsequently it is said that they were hanged from the tree's branches as an act of revenge. - Three brutal murders have occurred on Shades of Death Road (in the 1920s-30s), one of which included a beheading. - The nearby Bear Swamp (also called Cat Swamp or Cat Hollow Swamp) was once home to a large population of wildcats which were known to attack locals. In the 1800s malaria carrying mosquitoes flourished in the same swamp. - The winding road is rumored to have caused many car accidents - it has large reflective guardrails that hint at this. Though the road was known as Shades of Death Road before automobile use was common. Other paranormal sites nearby include Ghost Lake; where there have been many reported ghost sightings, the Fairy Hole; a small cave used by the Lenape; and Lenape Lane, another haunted road where visitors have seen ghosts and orbs - a certain 'red orb' is said to kill you instantly if you stare at it for too long. Weird NJ has personal accounts of people who have visited all of the above sites if you are interested in reading more. As for my personal experience on Shades of Death Road, a group of my friends and I all piled into two cars late one night to check it out. 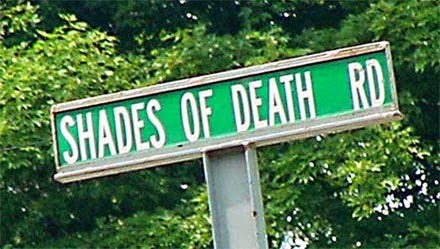 Sure enough, the road is actually called Shades of Death - I had thought that was a nickname someone had given it. We crept down the road for what felt like forever. I live in a very rural area, so to me it seemed like any other neighborhood street and some of the spookiness was lost on me. Plus, there are houses right near the side of the road, some of which still had the lights on! They were very clearly lived in and not at all scary. This fact alone took away from a lot of the eeriness. We tried turning the headlights off in our car and getting out at the end of the road. The only thing we heard were crickets. By now it was nearly 2am and no one had seen anything spooky. As we all returned home I learned that three friends in the other car had all fallen asleep during the drive down Shades of Death Road. One of them was the person who suggested we go in the first place, as well as the only one who had been there before and had seen 'orbs'. During high school I was always excited to visit these types of spots to give myself a scare. More often than not they ended up being a disappointment - Shades of Death Road was no exception. Pictured is the road sign. Another exists at the opposite end of the road that reads vertically. Emily, I enjoyed reading your post. I have read about this before in Weird NJ and always wanted to go, but just never had the chance too. The name of the road is definitely different and I thought someone just gave it that name but I guess not. While driving down that road I would definitely be a little creeped and spooked out. That's ashamed that none of you guys experienced anything the night that you went. I"ll definitely have to go check it out and see if I experience anything. I am from PA and we have places like this all over. Your post made me think of my hometown and I enjoyed reading your post. When I actually have free time I wouldn't mine driving up there to see it. I enjoy stuff like this and history behind it.